A2600 E.T. : The Extra-Terrestrial (USA) in 00:25.1 by CoolKirby & Alyosha. E.T. The Extraterrestial, based on the film of the same name, is one of the worst video games ever released. It contributed to Atari's massive financial losses during 1983 and 1984. As a result of overproduction and returns, millions of unsold cartridges were buried in an Alamogordo, New Mexico landfill. 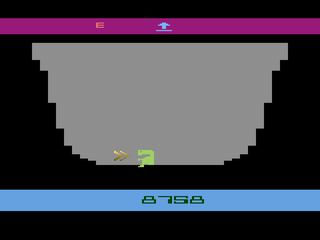 The game was developed in five weeks and Atari decided to skip audience testing for the product due to time limitations. CoolKirby and Alyosha shave off 0.03 seconds (2 frames) by turning around at the third phone part.